Sometime ago I was installing a vCenter and connecting the the ESX hosts. The host kept disconnecting after 1 minute or something. Reconnecting helped for 1 minute. The problem? I thought I disabled the firewall but this wasn't the case. The firewall was blocking the incoming connections. Disabling the firewall completely solved the problem. This leaves me to believe that the heart-beating is done in all directions ESX to ESX but also ESX to vCenter and vice versa ... interesting. Another great thing I encountered is a corrupted ESXi embedded IBM USB stick. The ESX hosts was asking for a Diagnostic dump partition. This was strange because I worked with the sticks before and they never needed one (dumping on a local partition / vicfg-dumpart -l to show). Also installing the VMware tools was giving errors about missing the cd's. Watching under the / root partition (unsupported mode/ls -al) was not showing the /store partition. After examining a "working" and a "non-working" ESXi and comparing the fdisk -l output, I noticed that a partition was missing. 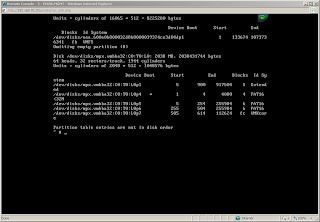 I reinstalled the ESXi with the recovery cd that you get when buying the embedded USB keys, fixed the problem.